Most of us who are older competitive runners are not able to race at anywhere near the same speed as we did when we were 30. But we can perhaps aim to slow down at the same pace as Bernard Lagat, Ed Whitlock and other greats of masters running, according to a new analysis by two professors from Yale University. The new analysis, which refines famous past research by one of the scientists, finds that, although declines in running performance with age are ineluctable, they may be less steep than many of us fear. And, perhaps most important, the new research updates a popular formula and calculator that runners past the age of 40 can use to determine how fast we can expect to slow down and provides us with reasonable, age-appropriate finishing-time targets for ourselves. Scientists do not know precisely why, from a physiological standpoint, we are less able to maintain our old, swifter pace as we reach middle age. There is evidence from past studies that even in lifelong athletes, hearts become a bit less efficient over time at pumping blood and delivering oxygen, and muscles a bit less adept at creating sustained power. Changes deep within our cells, particularly in the energy-producing mitochondria, are thought to contribute to these age-related performance declines, as are simpler explanations such as creeping weight gain and a drop-off in hard training. But the upshot is that, after a certain point, we cannot keep up with the kids or with our own previous bests. Professor Ray Fair, an economist at Yale who mainly analyses and predicts election outcomes, is familiar with this tribulation, since, now in his mid-70s, he is also an experienced masters marathon runner whose times have been slowing year by year. About a decade ago, he began to wonder whether his rate of performance decline was typical and, being a predictive statistical modeller, decided to find out. He turned first to information about world records for runners by age group. These times represent what is possible by the best runners in the world as they age. And cumulatively, he found, the records proved that champion runners slow like the rest of us. But there was a pattern to the slowing, Fair realised. As he reported in a 2007 study, the masters world record times rose in a linear fashion, with some hiccups, until about age 70, when they begin to soar at a much higher rate. But recently, Fair began to question whether his statistical model provided the best estimates of people’s likely race times and, for the new analysis, which was published in print in The Review of Economics and Statistics, he approached a Yale colleague, Edward Kaplan. Together, Fair and Kaplan reanalysed data about world masters running records through 2016 for the 5K, 10K, half-marathon and marathon events, up to age 95. They used only men’s records, since the number of older female participants has been small, Fair said, making current women’s records statistically suspect. They then ran the numbers, using several different models, and found that, overall, age-adjusted finishing times are slightly slower now than in the 2007 version, rising about 1 per cent a year. But runners seem to be maintaining that rate of decline longer, until they are about 80, when slowness drastically intensifies. 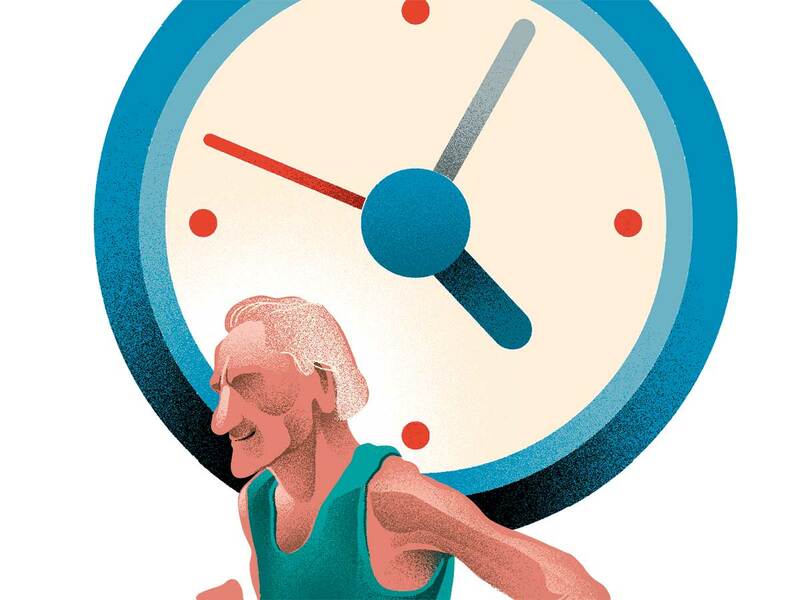 The new study’s extreme-value analysis also suggests that older runners have not yet become as fast as they could be. The complicated calculations indicate that current world records for older runners theoretically could drop by as much as 8 per cent in the future, Kaplan said, providing all of us new benchmarks for our own ageing performance. Fair has now introduced an updated version of his calculator, incorporating the new models. There, enter your best time for whichever event interests you and the age at which you set that time. If you were younger than 40, use age 40 anyway, since the calculator assumes you will not have slowed much before reaching that age, Fair said. You then will see your predicted times for your chosen event at every age through 95. These figures presume that you have continued to train and maintain high fitness over the years, which many of us have not. They also assume that recreational runners age and slow at the same rate as world-class runners, which has not been proven experimentally. But even with these limitations, Fair said, the predictions give us something to shoot for. “Aim for your regression line,” he said. Gretchen Reynolds writes the popular ‘Phys Ed’ column.